Tales of Berseria is due out on PlayStation 4 in early 2017 - along with just about every other game in existence it would seem - and to remind you of that fact, Bandai Namco's released a new trailer that's coated in English subtitles. Highlighting the action role-playing game's plot, the video gives us a look at how main character Velvet came to be, with her demonic arm and all that. We're especially liking the character designs in this latest entry, and from what we've heard, the battle system's pretty solid, too. 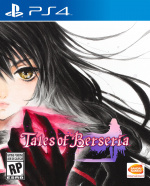 Is Tales of Berseria on your to buy list? Control your monster limbs in the comments section below. I skipped Zesteria, but I'm thinking of getting this one. Hopefully it doesn't fail in the review department. Where is Collectors Edition. Can't wait to play it. Always get excited for Tales. It pains me owning Vesperia yet not being able to play because no BC announced yet. Got Tales of Hearts R on Vita and Abyss on 3DS, Zesteria on PS4 and Symphonia on GameCube. And that Symphonia sequel on Wii. Seems like they make games for every system, or used to anyways. I think the main protagonist looks like a dude with a set of norks. @ApostateMage Really guess my eyes are better then yours.